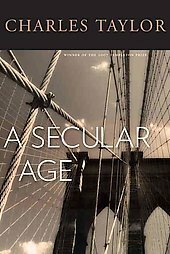 Despite the perfectly pitched limitations of its dust jacket, Charles Taylor’s A Secular Age possesses a definitive look about it—solid, dark, foreboding even, with imprints of gold and the Belknap Press. To make decisions independently of capitalism, to call upon the moral faculties over and against the culture that contains us, to somehow escape the orbit of secularity. These, to be sure, are admirable goals, ones that resonate with Taylor’s desire to reclaim versions of transcendence and fullness in a world hell-bent on implosion. I have profound sympathy for Taylor’s desire to recalibrate ourselves and our approach to secularity in light of the story he is telling. Rather than comment on the substance of Taylor’s magisterial effort, however, I want to think in and through its definitive air, and by extension, the atmosphere that quite literally surrounds its publication as well as contemporary academic conversations about secularism and secularity. Look around you. This atmosphere is massively mediated, quite literally haunted by technology—equipment in front of you, in your ears, and perhaps, in your bones; technical practices half-way around the world that, nonetheless, register their effects; machines that think for us and machines that provide, both literally and figuratively, the language we use to account for the past, to live in the present, and to dream about the future. Although technology may not possess a logic of its own, one would be hard pressed to deny its formative role in whatever we are talking about, right now, on this blog. To what degree are the blurry contours and devastating effects of secularism bound up with technology? To what extent does the process of providing terms for secularism and coming to terms with it run on iron-rails, inseparable from the utterly obscure relationship between humans and machines? What role has technology played in fueling the nova effect of secularism and how has it both motivated contemporary practices of naming secularism, of typologizing its seemingly endless permutations, and simultaneously rendered it impossible for such practices to deliver on their promises? Although I do not expect answers to these questions any time soon, such retorts serve as a plea to grapple with (as opposed to grasp) the emergence of secularism as, first and foremost, a series of interlinked technological phenomena, a vast network whose nodes are connected by the common vector of systematic treatment by the human, of the human, and for the human. What, then, are the prospects of encountering non-human otherness when the sky is the color of television? Whither transcendence within an atmosphere that reeks of burnt metal, thickened by chemical fumes, and is permeated by digital signals and waves of electricity? Not so good if we pause to survey the last 150 years of cultural criticism that have led up to Taylor’s effort to respond to the massive force that secularism has assumed in our contemporary moment. It is my sense that current debates over secularism resemble previous efforts to name that which has stultified human expression, corrupted our capacity to change, and has become an overwhelming obstacle to transcendence, variously construed. Many a theoretical concept has been deployed in the service of grasping the twists, turns, and folds of modernity’s discursive power. Although the names have changed, the songs about a Leviathanic discourse have remained reliably the same, at least until now: Marx’s vision of capitalism as an animistic totality, Weber’s iron cage, Heidegger’s world-picture, the culture industry of Adorno & Horkheimer, Debord’s spectacle, Foucault’s notion of biopower, to name only those currently on my theoretical iPod. Rather than claim that each of these concepts were fragmentary views of what is now referred to as secularism (although I am tempted), it is, perhaps, more productive to view this litany in terms of the their technological metaphoricity—factory and transportation networks (Marx), the smelting of consciousness (Weber), the calculating effects of a radio dial (Heidegger), cinema and public relations (Adorno & Horkheimer), television (Debord), and automation and feedback (Foucault). Again, the names change—referring often to the after-effects of Enlightenment—but each concept evokes technological conditions that pervade their particular scene of writing. Secular, secularism, secularity—at least on their face—are devoid of such technological particularity, implying, rather announcing themselves, as the terms that encompass the “systematic treatment” by the human, of the human, and for the human. No gears, guns, steam, or electricity to mark these words as a sign of their times. No institution or style of reasoning to serve as shorthand for hegemony. But in this absence of technological residue, debates over the meaning and scope of these words do reflect, from an odd angle, the technological tenor of their time. Today, if pressed to choose any one machine or technical application that is either formally or effectively dominant, one would be at a loss to name it. Even the connotation of “World Wide Web,” however Weberian in its simplicity, fails to do the job. The Internet is merely a piece (albeit a vastly complex piece) of an even vaster network of human effects that feel as though they come from nowhere in particular. Feedback or networks, however, given the strange loops often identified with secularism, could be seen as having a degree of nominal traction at this point in time. Indeed, there is something to be said for how automatic control and emergent conditions of technological practice have, themselves, pointed to the limits of human control over technology. It is not surprising, then, that Foucault’s notion of biopower, with its evocation of mechanisms of power being both the effect and cause of human relations, inflects much contemporary discussion of secularism. But as Deleuze reminds us, social experience cannot be reduced to the technologies that inform that experience. “The machines don’t explain anything,” he writes. “You have to analyze the collective apparatuses to which the machines are just one component.” In other words, machines alone cannot explain how secularism insinuated itself into the very pores of social being, making certain sensibilities feel right and rendering particular feelings non-sensical. The secular age, I suggest, with Deleuze and Dickinson as my witnesses, cannot be reduced to its machines, technics, or institutions. There is much more, and much less, involved. More, in the sense that the human has not become automated or fully incorporated into a network. Human agency, however bruised and beaten it has become over the past few centuries, still plays some obscure role in history. Less, however, in the sense that agency has become wholly irrelevant to the extent that the very binary between human and machine can no longer be secured. Yet attempts to demarcate the province of the human run rampant in the secular age. Such attempts emerge as a central preoccupation of the “buffered” self, whether they are pursued under the auspices of Christianity or Islam, new age therapeutics, foreign policy, or scholarship. To glimpse the impossibility of such boundary-making, however, to sense the way in which human and machines are both effects and causes of one another, is a moment of disabuse, vulnerability, deflation. To engage a secular age in a secular age by way of secular modalities of sustained objectivity, taxonomic desire, and feverish archiving is, perhaps, the fundamental irony of our present conversation. Whereas our enlightened forbearers once confidently waged battles against revelation—the proto-professional ethnographer or historian making the case for the centrality of the human—we are now ensconced professionals who, perhaps, have glimpsed the practical, and perhaps even logical folly of such demystifying enterprises. Perhaps the “docile and omnipotent” presence of technology has forced us to realize that simple unmasking will not do, that, God forbid, there is nothing worthy of a name lying dormant behind the pasteboard masks we have collectively constructed. Do we now, one is tempted to ask, not feel the breath of empty space? Consequently, contemporary discussions of secularism have the potential for profound disturbance. For to go back, as it were, and to reclaim the Latin letters that simultaneously structured the desires for, enmity towards, and analyses of modernity, is to admit a certain degree of categorical exhaustion. Such projects announce the arrival of a limit situation. They also invite opportunity for a different kind of reflection. For what happens after we have unscrewed our navel? The utter blurriness of the contemporary moment owes much to such irrevocable brokenness. This rupture, in turn, is bound up with the continual and technological envisioning and revisioning the human, a process when glimpsed becomes its own sort of revelation. Perhaps even a source of renewal. Which brings me back to the dust jacket of A Secular Age, a deliberately incomplete sheathing. My copy is written by “Charles Taylor” yet untouched by him and, most likely, by anyone else before I turned back its cover. Certainly not the encounter with radical otherness envisioned by Taylor or that which opens up to transcendence. But an encounter, nonetheless, one that, at least for me, fails to put a definitive stamp on the problem of secularism, no matter how much it appears to be the case. Which I take to be a mark of its success.